Help your dog survive being alone, without destroying your home! Much of what is called “separation anxiety” is really boredom, or the dog discovering the chance to engage in his favorite “hobbies” safely. If your dog spends every second that you’re home glued to your side, including sleeping times, and any destruction you find happens within the first 20 minutes of your absence (use a video camera to watch, or come back within a short time period) then it’s possible that you have a true case of separation anxiety. If your dog can spend the night away from you, and is comfortable being somewhat separated from you while you’re home, you probably do not really have separation anxiety – you are more likely to be dealing with boredom or just inappropriate chewing, barking, digging, etc. The dog chews on a variety of things, but chewing is often focused on items that smell most like you (or a particular person in your house) such as recently discarded clothes, including underwear or socks, or favorite chairs; and /or escape routes (doors or windows). The dog only chews these items when you’re gone. (If your dog chews on a few goodies, like the couch, or chews on things even when you’re around, you have a houseproofing problem – see the other training tips for advice). The dog pees or poops inappropriately, sometimes in many locations. The dog always shows these behaviors when left alone, even for short periods (30 minutes or less). The dog is wild to greet you, and is still stressed, anxious and clingy when you first arrive home. The dog does not appear “guilty” over destroyed items. Destruction begins soon after you leave; or possibly again shortly before you come home. The dog cannot be isolated from you at any time, even in a different room with the door closed. The dog sleeps with you. (This does not mean that all dogs who sleep with their owners will get separation anxiety. It does mean that dogs that survive being apart from you at night can probably survive it during the day, too). Sometimes, the dog can be left alone in a car (for any length of time) or other unusual location, without showing anxiety or destructiveness. Sometimes the dog can be left with anyone; sometimes it is one particular person whose absence triggers the anxiety or issues. The dog gets increasingly distressed as you prepare to leave. The dog is constantly following you and demanding your attention when you are home. Try to make your arrivals and departures very boring and low-key. Don’t make a big fuss over saying hello and goodbye. Be very casual and up-beat. Try to make interactions with your dog on your terms, not his. You pet him, treat him, or play with him when you want, and not when he asks for it. Get your dog used to your getting-ready-to-leave cues, like picking up keys and jacket. Go through these actions repeatedly during the time when you’re staying home, without actually leaving. If your dog has already learned to associate his fears with your departure cues, it will take a lot of repetitions before the dog will get it. 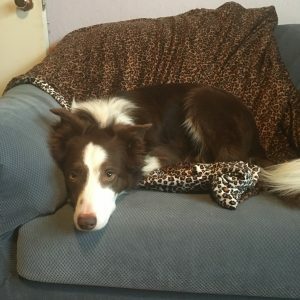 Give your dog something to do while you’re gone! What does your dog do all day- wait around for you to come home? Give your dog a hobby. Jean Donaldson calls the solution to a lot of dog problems “work-to-eat” programs. Stuff a Kong or a hollow prepared bone, fill up a Buster Cube or Roll-A-Treat, scatter the dog’s food in the grass or hide several chew treats around the house (see the Merchandise page for a description of some of these items). A dog that is working for goodies is not barking or chewing, and a dog that is eating is not as stressed! Consider crating your dog. Some dogs are more comfortable when confined to a small “den”. Make sure your dog can “hold it” for as long as you need him to, and provide plenty of exercise so that his main activity in the crate is sleeping. You might just want to consider leaving your dog in one room (rather than giving him the run of the house), and maybe leaving a radio on and an article of clothing that smells like you in the next room. Warning: Some dogs are a lot less comfortable confined to a crate when alone. Make sure your dog is comfortable and secure. Consider taking your dog to doggie daycare or to a friend’s house (or to work or on errands with you), so that he is not actually alone, while you train your dog to deal with being alone. Remember, dogs are pack animals that want to be with others; being a “lone wolf” can be dangerous in the wild, as well as lonely. Note that for many dogs who have bonded strongly with people, having another dog (or other pet) around will not be sufficient. Serious separation anxiety is indicated by a dog who does major property damage (chews holes through walls), injures himself in his anxiety (scratches or rubs paws or nose raw in digging or chewing), or stresses himself to the point of exhaustion during your absence. While stop-gap measures, like keeping the dog with you or with another person, will help while you train, you will need to spend a lot of time teaching this type of dog that he can survive being alone. Start by making sure your dog is getting enough exercise, including mental exercise (usually satisfied with some training and the chance to interact with other dogs or explore new places). Before you can retrain your dog (and it may take weeks or longer), arrange for the dog to not be alone – get a pet sitter, join a doggy daycare, or leave your dog with a friend who’s home all day. Get your dog used to being confined to a pen or room where you will eventually leave him, even when you’re home. Give him chew toys or some other interactive toy to occupy himself with while you quietly remain near by and ignore him. If your dog abandons the toy to try to demand your attention, quietly get him interested in the toy again, and quietly praise him for playing with it. Go back to ignoring him for a very brief period, and then intermittently, quietly praise or reward him for it. Practice this quiet confinement for a little while, then quietly open the door or gate and go about your business, allowing the dog to leave that area as well. This will be your dog’s “safety zone”. Do NOT leave your dog in this area when you must actually leave – for now. Throughout your time together, do not give in to your dog’s demands for your attention. If he comes to you whining, pawing, barking, jumping, jumping into your lap, or rubbing up against your hand, quietly turn away from him (you can stand up a little slowly to softly dump a small dog out of your lap). Wait until your dog is doing something else that is acceptable (not demanding your attention), and then call him over for some attention. Remember, if your dog can get your attention on demand any time you are home, it will be an even sharper contrast when you are gone. Some research has suggested that this process of no longer allowing your dog on your lap or your furniture, no longer allowing him to sleep in your room, no longer giving treats”for free”, and no longer allowing your dog to follow you throughout the house (using doors, baby gates, “stay” commands, etc.) may be vital for some separation anxiety cases. You may want to try a “Nothing In Life is Free” program. Next, pick a day (or two) when you can practice desensitization without having to actually leave – a weekend is a pretty good time to start. Figure out what begins your dog’s anxiety. Is it when you put on your work shoes? Brush your hair? Pick up your keys? Find the earliest item in your getting-ready-to-go sequence that makes your dog anxious. Then practice doing that action, over and over again, until your dog is no longer anxious about it. For example, put on your work shoes, then take them off, then put them on again, over and over. You don’t need to talk to your dog or do anything else special. Act just like you do every morning when you put on those shoes. When your dog is no longer anxious when you put on your shoes, move to the next step in your normal morning sequence; perhaps brushing your hair. (Note that if your dog’s anxiety does not decrease after several repetitions, you are probably not working on the first item in your getting-ready-to-go sequence, and you’ll need to back up). Repeat this exercise several times a day (5-10 times if possible), starting each sequence at a time when the dog is relaxed. Do NOT repeat the exercise if your dog seems MORE anxious when you start, or if he can’t settle down in between repetitions, or if he follows and watches you MORE between exercises. You will have to spend a LOT of time with the early items in your getting-ready-to-go sequence, but as your dog learns to deal with this sort of thing, it will get easier. Opening up the front door (presumably the last item in your getting-ready-to-go sequence) will take fewer repetitions than the first item (putting on work shoes, in this example). When you’ve worked through your whole getting-ready-to-go sequence and your dog is no longer anxious, you’re ready for your first absence session. Up to now, your dog with separation anxiety has associated absences with intense anxiety. The dog has to now learn to associate absences with a lack of anxiety, or calmness. You and the dog will practice being apart from each other for very short lengths of time – the time that your dog can handle – and you will gradually practice longer and longer lengths. “practice session”. This could involve asking the dog to stay in a different area (such as the pen or room you practiced in), leaving a radio on, even spraying a certain scent in the air. This becomes a “practice cue” or a “safety cue”. Walk out the door, shut it behind you, lock it, and then turn around, unlock it, and come back in. Don’t make a fuss over the dog. Repeat. When your dog is not anxious, lengthen your absence to 2 seconds. Repeat until your dog is not anxious. Lengthen your absences to 3 seconds, with occasional 1-second absences. Repeat until your dog is not anxious. Continue with this process, gradually increasing the length of time you are gone. Every once in a while practice a shorter session – you don’t want the dog to learn that each absence will be longer, as this might make him more anxious. Gradually increase the average length of time of your absence until the dog is alone for longer than your normal absence. (although some researchers write that two hours is a benchmark, after which the dog may be able to handle significantly longer time.) Yes, that means you will NOT be able to really leave the dog alone in the “safety zone” for longer than you’ve successfully practiced. Keep your dog in the old place where you had him wait, and/or hire a dog sitter, etc. It might help to set up some cues that the dog will not be alone for longer than he can handle, in other words, that this is just a practice session. Do you normally leave the radio or TV on when you’re home? If you do, the silence when you’re gone is a good indicator that the dog is alone. During this training, set up a cue that says “this is just a practice”, such as the sound of the radio or a Mozart CD that you leave on “repeat” on the CD player. When you really do leave, you will continue to play this same cue – the dog will always believe that this is just a practice session. Note: Some medications, such as the tricyclic antidepressants, buspirone and benzodiazepines (possibly clomipramine hydrochloride, “Clomicalm” or amitriptyline), may help your dog get over his anxiety. These MUST be prescribed by a knowledgeable veterinarian. However, some of these may take a few weeks to take effect, so you will need to make sure the medications are in effect before you try to use them in combination with the desensitization. The medications will not work in the long-term without the desensitization/counter-conditioning work – the process of teaching the dog how to deal with being left alone. Another thing you might want to consider is a product which is a sort of doggy “plug-in” called Adaptil (formerly “Comfort Zone with DAP”), which releases a chemical which is supposed to be a dog comforting hormone. It often helps to calm stressed or excited dogs down. See petcomfortzone.com for more information. For some “anxious dogs” it seems to really help take the edge off of their anxiety or intensity. Some researchers suggest that it may be as effective as clomipramine. Homeopathic remedies like the Bach Flower Essence mix “Rescue Remedy”, may also help calm a very anxious dog during training. You should talk to your vet (traditional or holistic) about using these items to help. Visit the Alternative Veterinary Medicine webpage to find a holistic vet near you. Other recommendations include increasing Vitamin D (either through nutrition, supplements, or greater exposure to sunshine). This is an outline of the steps that you must go through to help your dog deal with separation anxiety. The process takes a long time – weeks or months – and you may find that an experienced dog trainer or behaviorist can help the process go more smoothly and more quickly. Nicole Wilde’s Don’t Leave Me! Stephanie Colman has a discussion of teaching your dog be alone comfortably as part of her “Six behaviors every dog should know” article. Manual of Canine and Feline Behavioural Medicine. Last Updated February 2019 by Stacy Braslau-Schneck.